Emergency and Humanitarian Responses: Responding to emergency situation and providing humanitarian aid are at the heart of Muslim Aid’s development philosophy. Muslim Aid does not consider emergency response mere a charity work but it views that response to the needs of the people living in vulnerabilities is both a moral and developmental obligation. People living in vulnerabilities are people who cannot manage livelihood in a normal way and thus they have rather more legitimate right to be served by any humanitarian and development organization. Since the inception, both Muslim Aid HQ and Bangladesh Field Office have been devotedly working to alleviate people’s sufferings through different emergency and humanitarian programmes. Indeed, the genesis of MABFO was a result of humanitarian response of Muslim Aid HQ to the aftermath situation of the fatal Cyclone of 1991 that left the mark of massive devastation across the coastal belt of the country. (7) take effective measures to reduce gender based violence in emergencies. MABFO has implemented 12 emergency response and rehabilitation projectsin 2016 and served 133,969 beneficiaries through disaster response and riskmanagement initiatives in partnership with ECHO, UMCOR, UNDP, WFP, Al-AsmakhFoundation and START Network inKurigram, Sirajgonj, Bhola, Patuakhali, Satkhira, Chittagong and Dhaka districts. Flood Recovery Project: an Un Joint Initiative: Muslim Aid has implemented the Flood Recovery Project in partnership with United Nations Development Programme (UNDP) in Nageswari Upazila of Kurigram district. Beneficiaries after being selected through a rigorous survey and analysis have been organized, oriented, engaged in Cash for Work and provided with various types of supports including rebuilt family shelters and its relocation through cluster villages in the remote char areas of the river Jamuna. A total 113 cluster villages were developed with 834 households (HHs) and 4076 people were engaged in Cash for Work (CFW) to work on mitigating the impact of further flood. European Commission Humanitarian Aid and Civil Protection (ECHO) supported - Resilience Project: In partnership with ECHO MABFO has implemented the project “Enhance Resilience of the most Vulnerable Community to Cope in Satkhira and Jessore district in Bangladesh” in Tala Upazila of Satkhira district. Muslim Aid has been implementing it in DeSHARI consortium and in partnership with ACF. This project will continue up to the end of 2017 by an expert team. The project has been creating a number stories through making changes in the lives of its beneficiaries. ECHO supported early recovery project: Muslim Aid implemented a project on “Early Recovery support to Tropical Storm Roanu affected people in Chittagong, Cox’s Bazar and Bhola districts of Bangladesh” in partnership with European Commission Humanitarian Aid and Civil Protection (ECHO). Muslim Aid concentrated at Chonua and Gandamara Unions of Banskhali Upazila in Chittagong District and Monpura sadar union of Monpura Upazila in Bhola district. 2412 HHs received Cash For Work (CFW) support @ BDT 4000 in 13 days. 105 HHs received unconditional grant @ BDT 8000. Emergency relief in partnership with United Methodist Committee on Relief (UMCOR): Muslim Aid distributed unconditional cash grant cash @ BDT 4000 and hygiene kits to 742 families affected by cyclone Roanu in Shekherkhil, Gondamara and Chonua unions of Banskhali upazilla of Chittagong district with the support of the United Methodist Committee on Relief (UMCOR)-USA. Each of 742 families also received a hygiene pack containing bathing soap (2pcs), laundry soap (2pcs), sanitary napkin (1 pack/5pcs), aluminium pitcher with lid (1pc), bucket (1pc), and Oral Saline (ORS 10 sachets). Engagement of local community and local government institutions were very much effective in selecting beneficiaries including female, male, widow, elderly and the persons with disabilities (PWDs). Special attention was given to the PWDs, pregnant and lactating mothers and people with chronic diseases. Emergency Response to Flood affected communities Supported by UMCOR: In partnership with UMCOR Muslim Aid implemented Emergency Response to the Flood Affected Communities in Sadar Upazila of Sirajgonj District of Bangladesh. A total of 905 HHs received unconditional cash grant @ BDT 4000 and hygiene kits containing bathing soap (2pcs), laundry soap (2pcs), sanitary napkin (1 pack/5pcs), plastic bucket with lid (1pc), and Oral Saline (ORS 10 sachets). Muslim Aid is a member of START Network: The Start Fund Bangladesh Programme is being managed by the Start Network (www.startnetwork.org). The Start Network is made up of 42 national and international aid agencies from five continents. Its aim is to deliver effective aid, harnessing the power and knowledge of the network to make faster and better decisions to help people affected by crises. Start is developing more effective ways to work together, and new approaches that will reduce the scale of human suffering. Start Network is currently hosted by Save the Children UK, a member organizations of the network. In 2016 Muslim Aid achieved two funding from START Network in partnership with Action Contre la Faim (ACF) and Christian Aid (CA). The Start Fund was created to fill a gap in humanitarian funding. It enables NGOs to make collective decisions on the basis of need alone and to respond early and fast to ‘under the radar’ emergencies. 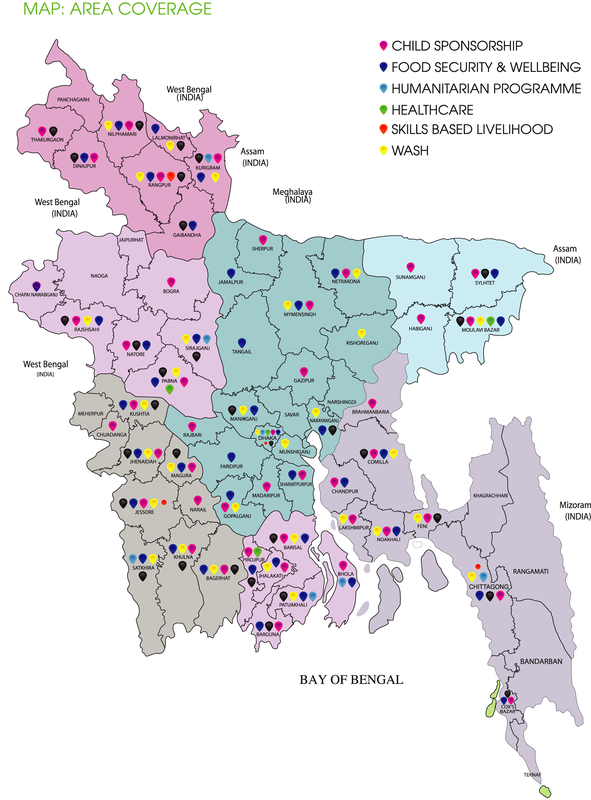 17 of the Start Network’s membership have an operational presence in Bangladesh. The Start Fund provides small-scale grants for small to medium scale emergencies. It disburses funds within 72 hrs of being alerted. It begins implementation in 7 days and completed in 45 days. 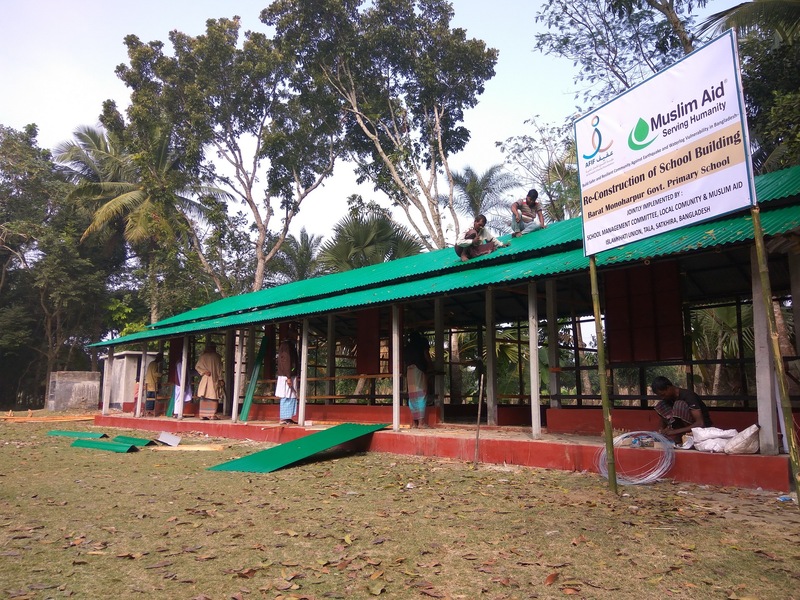 Emergency response to the cyclone Roanu affected Community Supported by START Network: Muslim Aid in partnership with ACF implemented the project Emergency Response to the Cyclone Roanu Affected Communities in Banskhali Upazila of Chittagong district with START Fund in 2016. It was implemented in Gondamara and Chonua Union of Banskhali Upazilla, Chittagong. Under the project, MABFO provided unconditional cash grant (UCG) @ 4000 taka/ HH and hygiene kits to 3000 households (HHs). Response to Flood in North West Districts Supported by START Network: Muslim Aid distributed emergency relief to 1213 HHs of Nunkhawa, Kachakata and Narayanpur Unions of Nageswari Upazila in Kurigram district in partnership with Christian Aid. The supports included unconditional cash grant @ BDT4000/HH, hygiene kits and emergency shelter material (tarpaulin). Enhancing Resilience Plus (ER+) Project Supported by World Food Programme (WFP): The ER+ project provides two types of facilities for the ultra-poor peoples and also for the climate vulnerable communities in Kalapara Upazila of Patuakhali district. One is to create job opportunity for the 1000 ultra-poor families through Cash grant and Income Generating Activities (IGAs). Another one objective is to create individual assets of 1500 families for future use in sustainable way in order to confront disaster effects. Total coverage of the project is 2500 families, 100% beneficiaries of the project were female. It has been observed that the trend of climate migration of people in this area has been reduced through creation of family-assets and livelihoods also making their habitats disaster resilient. The local traditional IGAs have been improved through a series of orientation, training, input support, frequent follow up and consultation from Muslim Aid’s Tala office. Rice distribution to 2950 Roanu affected Households Supported by WFP: In June 2016, Muslim Aid distributed a total of 74 metric ton rice (25kg rice/HH) to 2,950 HHs affected by cyclone Roanu in Tazumuddin Upazila of Bhola district and Kalapara Upazila of Patuakhali district under WFP supported emergency response project. 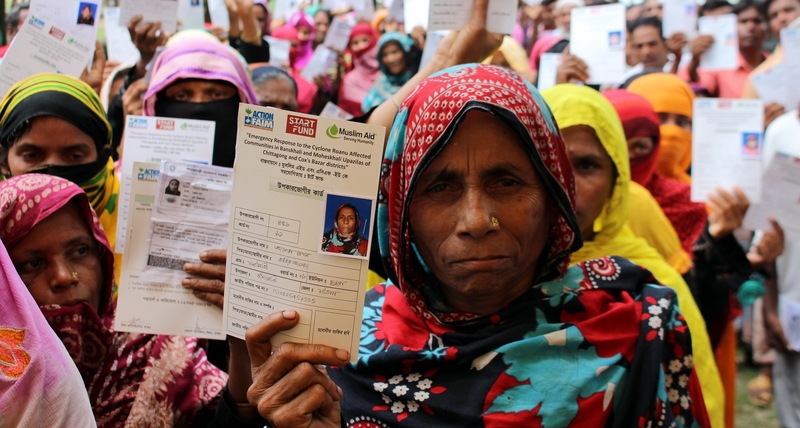 Cash Grant to 1960 HHs through Enhancing Resilience Programme Supported by WFP: Muslim Aid implemented WFP’s Enhancing Resilience Programme in 2016 in Tazumuddin Upazila of Bhola and Kalapara Upazila of Patuakhali districts. Through door to door survey, 1960 (including 47 persons with disabilities) beneficiaries of what 1500 from Tazumuddin, Bhola and 460 from Kalapara, Patuakhali, were selected for the project. Muslim Aid provided unconditional cash grant to the beneficiary households (HHs) and each HH received BDT 8000 in two installments. Partnership with the Educational, Charitable and Humanitarian Organization (ECHO)-USA: An early response project was implemented in Chapainawabgonj district and distributed food package to 110 flood affected households. The programme was executed by one of the partner organizations of Muslim Aid called “IFBC Foundation” in the area. It was done in great cooperation and coordination from the local administration and local government bodies. 6450 Blankets for the Northern Cold Wave affected people, mostly the PWDs Muslim Aid distributed new blankets as warm clothes for the People with Disability (PWDs) in different parts of the North Bengal, affected by cold wave. Mr. Zunaid Ahmed Palak, Honorable State Minister for ICT of the Government distributed blankets among 300 PWDs at Singra Upazila Natore. A total of 6450 blankets were distributed in Nilphamari, Dinajpur, Rajshahi, Natore, Bhola, Lalmonirhat, Shariatpur and Satkhira districts. It was done with the financial assistance of Muslim Aid Australia from where Mr. Foez Dewan, Secretary of the Board of Trustees and Dr. Idris Dewan, Former Member of the Planning Commission of Bangladesh Government were present in a distribution. An unique project with Al-Asmakh Charity Foundation: Muslim Aid implemented a project “Build Safer and Resilient Community against Earthquake and Waterlog vulnerability in Bangladesh” with the objective of Ensuring food security by developing employment opportunity, and providing sustainable livelihood options by means of livelihood support and knowledge where 1100 HHs received livelihood and homestead gardening supports in Tala Upazila of Satkhira district. There were a number of training and workshop in participation of the local community including the beneficiary households. Among 1100 HHs each of 500 received BDT 12000 Cash grant for food and livelihood supports, 600 HHs received Homestead Gardening support with an amount of BDT 2500 each. Another objective of the project was to build disaster response mechanism through improving capacity of local community. Muslim Aid conducted Community Risk Assessment (CRA) as well as Fast Track CRA To identify and compile the gaps in the Resilience and DRR of a particular hazard or multi hazard in the identified geographical locations; To identify the environmental issues link to any hazard in particular geographic area & understand the vulnerability with respect to disasters; To find the ways of reaching to better option that could be possible solution to become disaster resilient. Ferry Boat introduction for Dadpur High School; Sanitary latrine reconstruction at Nagla P S Fazil Madrasha, Balarampur Poschim Primary School, Nayakahi Dhakhil Madrasha, Bichayon Primary School, Barat High School, Barat Monoharpur Primary School and Kazirdanga community health center. 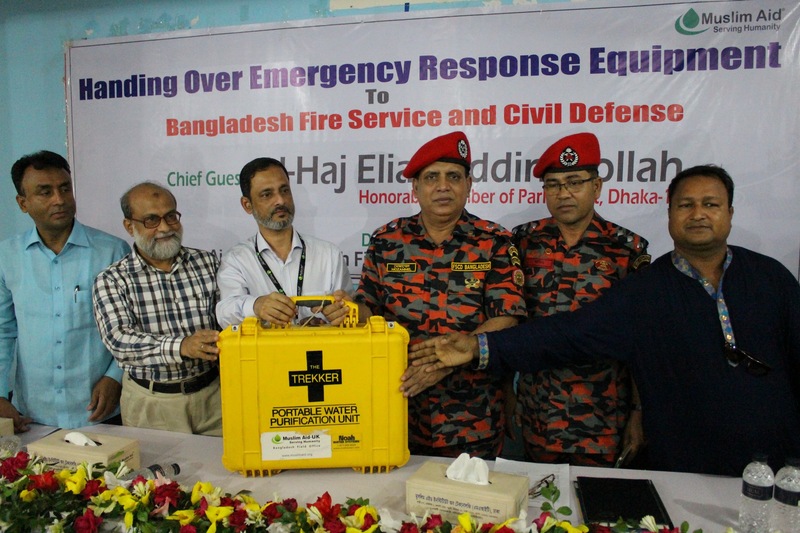 The schools along with 12 Union Parishads, Tala Upazila Parishad, Police Station, government offices at the Upazila and District have been provided with the sets of firefighting and emergency rescue items including fire extinguisher, stretcher, first aid box, mega phone, etc. The livelihood support was specially designed and implemented in line with the strategies of Satkhira district administration’s Beggar free district announcement. • SBDP (School Based Disaster Preparedness) on earthquake safety for the schools. The schools at rural and urban environment were selected based on the identified vulnerability of the schools by following specific guidance from Government education department, school teachers and management committees. In participation of the school students volunteer groups have been formed who have been provided with training, equipment and mock drill / simulation with the technical support from Bangladesh Fire Service and Civil Defense, a technical partner of Muslim Aid. All selected volunteers received training on first aid, search, rescue and early warning and necessary equipment. Teachers, students and SMC members also involved with this activities for mitigating earthquake risks. Institutes are also agreed to continue the simulation and conduct at least 2 simulation exercises in a year. Food Aid and Well Being: Objective is to help the poor and needy fasting people. In 2017, 60,000 beneficiaries of poor and deserving families especially women including - widow, PWD, Women headed family, elderly, PLW (Pregnant and Lactating Women).